Hello, my name is Rebecca Washington, I just started working at Music & Arts this summer of 2016 with an interest to learn more about different instruments and types of music. This will be my first job and I am very excited to be employeed somewhere that caters to my hobby and love for music and musicianship. I am a clarinet player and I have been playing for eight years now. I just graduated high school and was in the Byrnes' Rebel Regiment, which is a local high school marching band. I started marching in the 7th grade and marched all throughout my high school career. During my marching years I became Band Manager, and clarinet section leader. I also sing with the youth choir at my church in Greenville. I am now attending USC Upstate and hope to be part of the jazz band there, and possibly the upstate chorus. 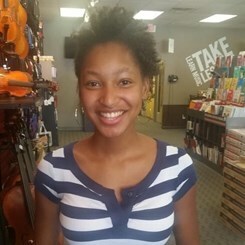 I am also interested in learning a new instrument, my first choice being guitar, and while working here I hope to be able to pick up skills from my coworkers and customers. I look foward to being apart of the Music & Arts family, and I can't wait to start this new journey. I hope you come on in and see me and allow me to meet some new faces and talk music.